A very sweet and loving pair of sisters. Aphrodite is outgoing, Athena a little less. Athena is shorthair, and her sister Aphrodite is medium-hair. They love to be petted and lie in your lap. Athena also likes to climb onto her foster mom's shoulder. Both are very playful and are especially fond of wand toys, jumping up high to reach for them. They also love to play with a variety of other toys like little balls and toy mice. 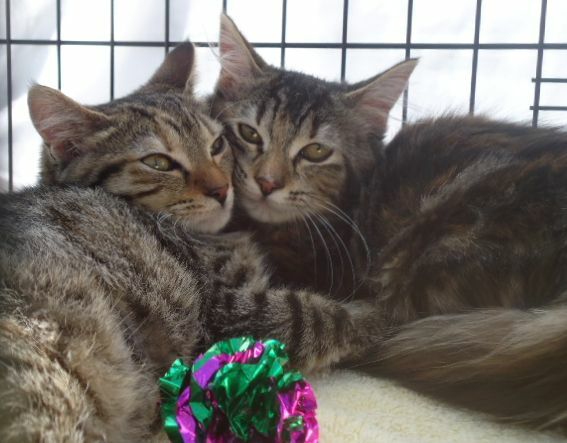 They are a bonded pair, good with other kitties, and would love to be adopted together. Athena and Aphrodite are vaccinated, tested negative for FIV and Feline Leukemia, and are microchipped. Contact WebmSoft Spot with website-specific questions or comments.